They say there are no titans in highsec, but that's not quite true. The Agents of the New Order are highsec's titans. Our Agents frequently get mail from people they don't recognize. GLORIA PRIDES sent a cryptic message to Agent Alt 00. Since Alt 00 didn't remember GLORIA, she shrugged it off and moved on. The next day, Alt 00 received another EVEmail from GLORIA, who indicated this was the beginning of a long-term relationship between the two parties. 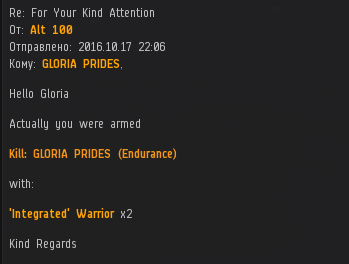 Now it was worth it for Alt 00 to investigate the history of GLORIA PRIDES. Our Agent had ganked GLORIA's Endurance. Interestingly, the gank took place a few days prior to GLORIA's first EVEmail. Either the miner was taking multiple days to calm down, or she'd been AFK for a few days and only now discovered her ship loss. Upon further investigation, both possibilities seemed equally likely. GLORIA was in luck. Our Agent had lots of experience in helping miners. Maybe Alt 00 misjudged GLORIA. The next day, the miner vowed revenge--and claimed to have reinforcements at her disposal. The hunter was about to become the hunted. Of course, anyone who's lived in nullsec knows that it can take time to assemble a fleet. GLORIA kept herself busy by sending a series of EVEmails. After some rapid-fire tears, GLORIA took a well-earned break for a few hours. Then she started up again. But GLORIA was still tired, so she went silent for a few more hours. When our Agent logged on, she had a large backlog of mail to go through. Alt 00 is very diligent. As she reviewed the correspondence, she gathered some materials together and sent them to GLORIA in one helpful package. Alt 00 succeeded in breaking through. GLORIA communicated her main objection to the New Order. She was upset that she'd been killed when flying an unarmed ship. However, Alt 00 knew better. The whole controversy had been based on a misunderstanding! Now the Agent and the miner could put their differences aside. There was no more reason for GLORIA not to obey the Code. After a brief pause, GLORIA decided she wasn't interested in reconciliation. The miner no longer had the luxury of believing she'd been unfairly killed. She knew she was on the wrong side of things, but she didn't care. At the very moment she should've been putting all her energy into self-improvement, GLORIA directed her anger outward. And Alt 00 was a convenient target because she'd made herself available to the miner, to help her. What a sorry state of affairs. But the miner's anger burned itself out just as suddenly as it had been kindled. GLORIA vanished into the ether, never to write again. The miner's promised revenge never came to pass. 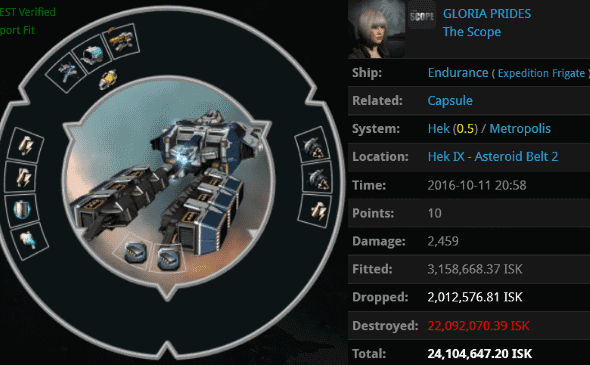 Maybe GLORIA's huge fleet of allies from nullsec talked some sense into her. 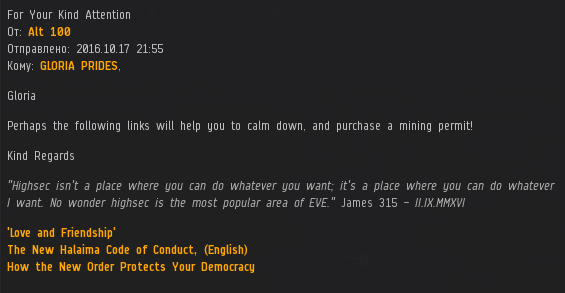 And maybe--just maybe--the next time she sends an EVEmail to Alt 00, it will be accompanied by a payment of 10 million isk. CODE. has been dying for four years, and yet we are stronger than ever! There are rules in the TOS about abusive, hateful, obscene, sexually explicit, and vulgar language. This miner should be reported. Even worse, he violated the Code, but Alt 00 brought him to justice and provided some necessary education. But really CODE is a dead alliance. Just drones of James 315 left over. They don't know any different. You cannot blame them. I thought all agents were just James alts? After reading this, I assume that being a goat is a very bad thing in Russia. ..a bad thing anywhere, Dr. "Козёл" (pron. Kazyol) does indeed mean 'goat' in russian. Applied to a person, however, it conveys the qualities 'mean' and 'nasty'. Perhaps Agent Salah will correct me if I've muddled my russian. My mistake, Anon. Curiously enough, Ukrainian for 'goat' is 'коза' (? pron. 'Kaza'), which is fairly close to the Russian, and the same word as the Bulgarian. It's possible that referring to someone as a 'goat' carries the same intention in all these lands. 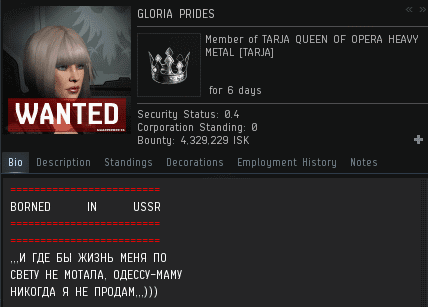 "Interestingly, the gank took place a few days prior to GLORIA's first EVEmail. Either the miner was taking multiple days to calm down, or she'd been AFK for a few days and only now discovered her ship loss." Little gems like this are the reason i read this page every day. Dead? I continue an average of 10 exhumer kills when i log in. all illegal. "Skiffs all over the place are being killed in mackinaws and hulks"
Good evening LADY W.C and JENTELMENS. Hey Pix! Good to 'see' you. Every time I read about the adventures of Code Agents I ask myself why I am still in a nullsec Alliance and not High Sec.